Is Dominion Resources A Potential Buy? As mentioned earlier this week there are couple of potential candidates for my fund. My favorite one is Dominion Resources as it is a high quality utility company at a cheap price. At the moment it is priced at $63.94 USD which means in the last 3 month there is a decrease of -15.05% and -25.04% from its 52 week high. But let’s have a look at the fundamentals if it is worth to invest in the company. Dominion Resources, Inc.(D) is an energy producer and transporter. The company’s business consists of electric power generation and transmission and natural gas storage and transmission, serving customers in 14 states. Dominion was founded in 1983 and is headquartered in Richmond, Virginia. Currently it pays a yearly dividend of $3.32 USD, and has increased its dividend in the last 9 years. As you can see the current ratios are besides of the Price/Sales ratio all below the 5 year average. Using my current method to calculate a fair share price based on the 5 year average numbers, I would get a price of $86.70 USD so from that perspective the current level of the share price is very cheap. If I use the Market Fair Value Ratio according to Morningstar I would get a price of $60.90 USD. How much dividend income would I generate in next 8 years? 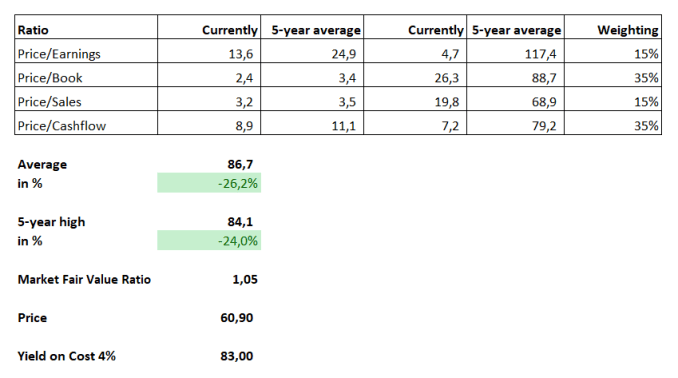 As you can see I am not expecting a large growth in the yearly dividend but I also think the current free cashflow and EPS situation leaves enough room for future growth. I choose a moderate growth rate as I am not expecting that the latest increase in the dividend will be good indicator for the future. So let’s finally have a look at the most important part the financial situation of D. Well to be honest about it I am not happy of the development of the equity. There is a constant decrease in it in the last 10 years and I think it should be one the company’s goals to reduce the debt level in the future. But nevertheless the situation is still okay as there is still enough cashflow out there.